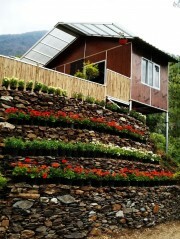 Escape into the misty, mountains of Uttarakhand and spend a night with gorgeous views of the hills around Nainital. You'll stay in comfortable cottage rooms at the campsite and take part in thrilling adventure activities like rappelling or Flying Fox. You can also go on a trek to a nearby waterfall and explore the forests. In the evening, enjoy some hot tea with sunset views over the Himalayas. After dinner, you can gather around the campsite bonfire to keep warm, listen to light music, view the star-studded sky and enjoy a peaceful night. 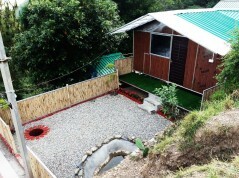 A minimum of two travellers are required to book this camping trip to Pangot with cottage stay. 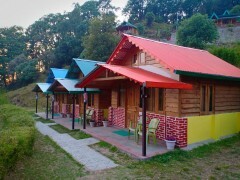 Perched at an altitude of over 6,300 feet, Pangot is a small village near the hill station of Nainital. Your campsite is located over terraced farms and fields on a mountain slope, offering exquisite views of the neighbouring hills. Lush green landscapes, dense forests and wilderness with alpine birds surround the campsite. The nature-rich environment, where you'll enjoy activities like trekking and rappelling, makes the campsite a perfect destination for a holiday with your family or friends. 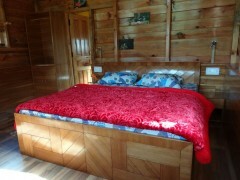 During your stay at the campsite, you’ll spend the night in cottage rooms with attached washroom, small table, comfortable beds with blankets and pillows. Delicious, freshly-prepared meals are served at the campsite restaurant. 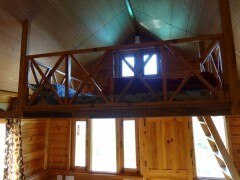 • Spend a night in cottage rooms at a scenic campsite. 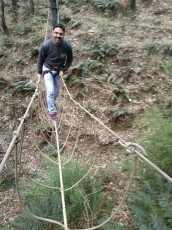 • Try activities like rappelling, trekking and Flying Fox. • Gather around a bonfire with music at night. • Escape from the city for a holiday in nature. Camping at Pangot is a non-strenuous activity. However, if you have any pre-existing medical conditions, please consult your personal physician before booking this trip. Travellers are required to follow instructions of the tour guides while engaging in any adventure activity. For cancellations made more than 30 days before check-in date of camping in Pangot: 100% refund. For cancellations made more between 15-30 days before check-in date of camping in Pangot: 50% refund. For cancellations made less than 15 days before check-in date of camping in Pangot: no refund. In case of cancellations due to bad weather, road blocks or other unforeseen circumstances: no refund. Bookings for children younger than 5 years are not charged. Bookings for children between the ages of 5-11 years will be charged at 50% of the listed price for adults. Bookings for children older than 11 years are charged at full price. Prices displayed may be subject to a premium on long weekends and national holidays. There is no pick-up for this Pangot camping trip. There is no drop-off for this Pangot camping trip. 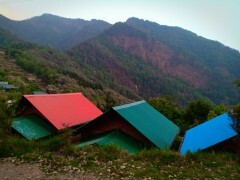 Day 1 of camping at Pangot: Check-in and enjoy! Arrive at the campsite and check-in to your cottage rooms. You can spend the rest of the day at leisure. Head out for lunch or take a stroll to explore the surroundings. Take part in thrilling adventure activities like rappelling or flying fox. You can also go on a trek to a nearby waterfall. In the evening, enjoy some hot tea with sunset views of the mountains. After dinner, you can gather around the campsite bonfire to keep warm and listen to light music. Overnight in cottage rooms at the Pangot campsite. Wake up and spend a lazy morning at the campsite. You can sip some hot tea and admire beautiful, misty views of the surrounding hills. Post breakfast, you'll check-out of the campsite. Your trip ends here. 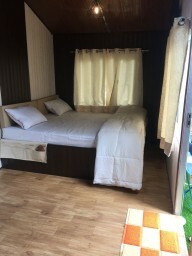 Overnight in cottage rooms at Pangot campsite. 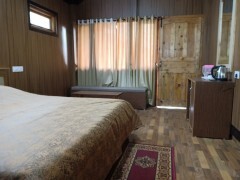 You'll be accommodated in cottage rooms with attached washrooms, small table and comfortable beds with blankets and pillows. Today's meal package includes lunch and dinner only. 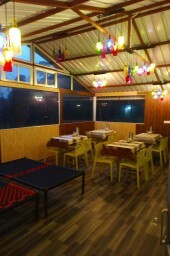 You'll also be served a non-alcoholic welcome drink on arrival and snacks with tea in the evening. Today's meal package includes breakfast only. You'll check-out of the campsite after breakfast. Depending on availability, you can also extend your stay at the campsite. 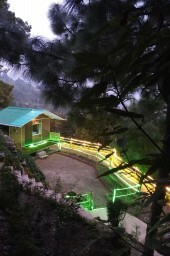 The campsite, accessible via road, is located 20-km/1-hr drive from Nainital, 55-km/2-hr drive from Kathgodam railway station and 100-km/3-hr drive from Pantnagar Airport.